Click Here To Read Customer Reviews & Ratings on Amazon, Now! AR Blue Clean AR118 Pressure Washer is one of the most compact electric pressure washers available in the market. It is a very lightweight pressure washer that you can easily carry by hand to anywhere at any time. The engine provides the water pressure of 1500 PSI along with 1.5 GPM of water flow which is enough to do all the household cleanings comfortably. Along with the expert spray gun, you are going to get a variable fan nozzle for different cleaning experience. The 30-foot power cord and the 20-foot high-pressure hose give a good stretch to clean all the corners of your garden. There is an 11 oz. detergent tank for your easy detergent application and altogether the weight of the product is only 11.7 pounds. When you are thinking about cleaning your house and residential things or doing all the lightweight jobs you can easily depend on this pressure washer. The pressure washer has 12 Amp/1.3 HP universal motor and a tri-axial pump. They deliver 1500 PSI of water pressure and 1.5 GPM of water flow. The automatic safety valve with the pump head pressure shut off provides safety of the operator along with unit longevity. It has AR 3 Axial-Piston Wobble Plate pump that lasts long than the other pumps. It is also cost effective. AR Blue Clean AR118 Pressure Washer has Total Stop System (TSS). This feature shuts down the pump when the trigger is not engaged. This facility of the device increases the pump life and prevents overheating. The device also comes with Ground Fault Circuit Interrupter (GCFI) feature. It gives you security when you use it on wet ground. There is an expert spray gun that has a rotary nozzle to adjust the pressure of water for different cleaning. The length of the cord is 30 foot and the length of the hose is 20 foot. 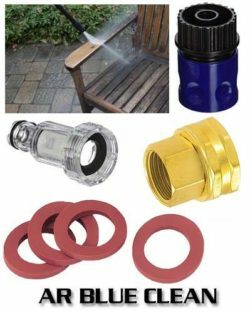 You can easily take the spray gun to any corner of your garden. 11 oz. detergent tank is available with the device along with the detergent injector kit. It helps you do a convenient and effective clean. When assembled the device becomes 10 inches in height, 9 inches in width and 14.5 inches in depth. The net weight of the device is only 11.7 pounds. HP Universal Motor: The 12 Amp/1.3 HP universal motor of AR Blue Clean AR118 Pressure Washer is very efficient for using for residential purpose. The power of the motor provides 1500 PSI of water pressure with 1.5 GPM of water flow which is more than enough for washing your house, car, driveway, fence and many more things. When you are not thinking of using the device for the commercial purpose the machine gives you full support. Total Stop System (TSS): The device has a very important and effective system that is Total Stop System (TSS). This feature saves the energy and increases the motor life. Because of this system the pump automatically shuts down when you are not using the trigger. It prevents the engine and the motor from overheating. You can relax if you are not feeling like ejecting the plug after using the device for a long time. It automatically shuts off the pump and you can unplug it whenever you feel like. Detergent Tank: The device has 11 oz. detergent tank for your proper cleaning. The tank attaches to the spray wand to mixes the detergent properly with the water. It gives you a shiny feel after cleaning the object. You can easily adjust the water pressure of water by rotating the nozzle head. Carry Easily: The device is so light that you can easily carry it from one place to another by picking it up. The 11.7-pound weight doesn’t give you any hurdle in carrying it. The 30-foot power cord and 20 foot HP hose gives you an excellent stretch. Safety and Warranty: The power cord has the feature of Ground Fault Circuit Interrupter (GCFI). This feature provides you safety if the ground is wet. The company also provides you 1 year of bumper to bumper warranty. So if you find any manufacturing defect within one year doesn’t worry, the company will take the responsibility. Annovi Reverberi is CSA approved and is famous for its quality pressure washers. When you are running short of budget and want to buy a good quality pressure washer for your residential use it can be your best option. 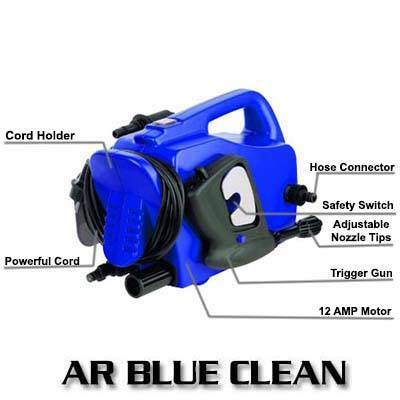 AR Blue Clean AR118 Pressure Washer provides you much more than what you pay for it. It doesn’t take much space for storing and can fit in any corner of your store room. Don’t worry about its performance as most of the users gave a very good review about this pressure washer. Check Latest Price & Buy Now on Amazon with FREE Shipment!